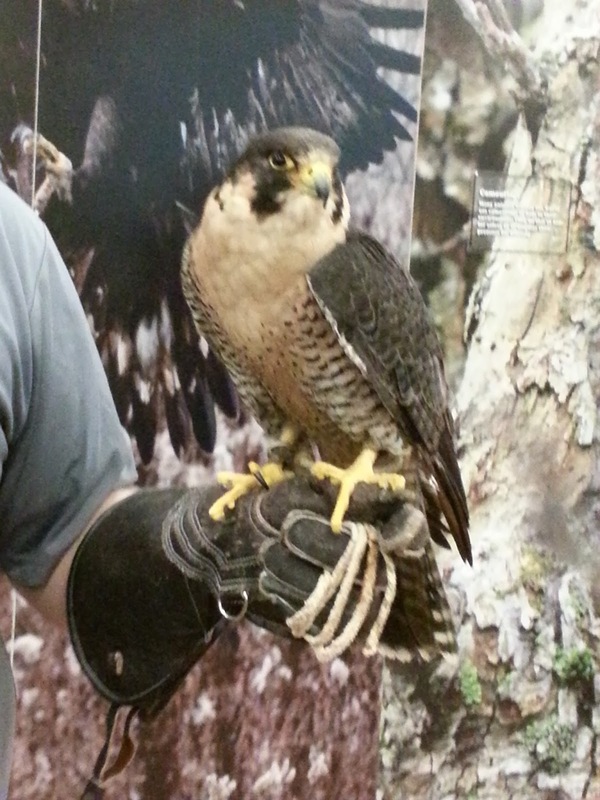 As the author of a book called Hawk, I was naturally interested when the Canadian Raptor Conservancy came to Regina earlier this month. This group has a focus on conservation and education, bringing live bird shows across Canada. 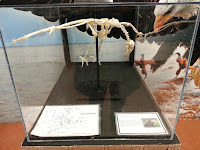 Many of the species are endangered, so the shows offer a unique opportunity for the public to see these birds up close. In Regina, we saw a great horned owl, several species of falcons and hawks, and even a bald eagle. During the shows, the handlers use posts for the birds set in strategic areas around the room. They carry the birds to the posts, then walk away. At a signal, the birds swoop through the crowd -- often right overhead -- to fly back to the handlers for their reward. The show set up in Evraz Place in Regina to get enough room for these dramatic flights that quickly won over the crowds on a cold January weekend. That also let them set up displays of falconry equipment, wall-sized photos, and display cabinets of bird feather, bones, anatomy, and a full-sized mural of bird wingspans for children to compare against their own outstretched arms. The combination of macabre and informative displays made for exciting set-ups to catch the attention of the crowd between shows. Between the shows and the displays, people who attended had many opportunities to learn a few facts about the birds and their handlers. For example, the peregrine is the fastest bird in the animal kingdom. In a dive (or stoop), peregrines tuck in their wings in a teardrop shape to reach speeds of over 300 k/h (200 mph). 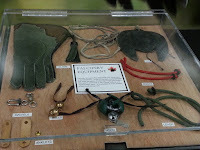 With breeding programs for more than 15 species, the Ontario facility houses some 200 birds bred in captivity, and releases some of these birds back into the wild. 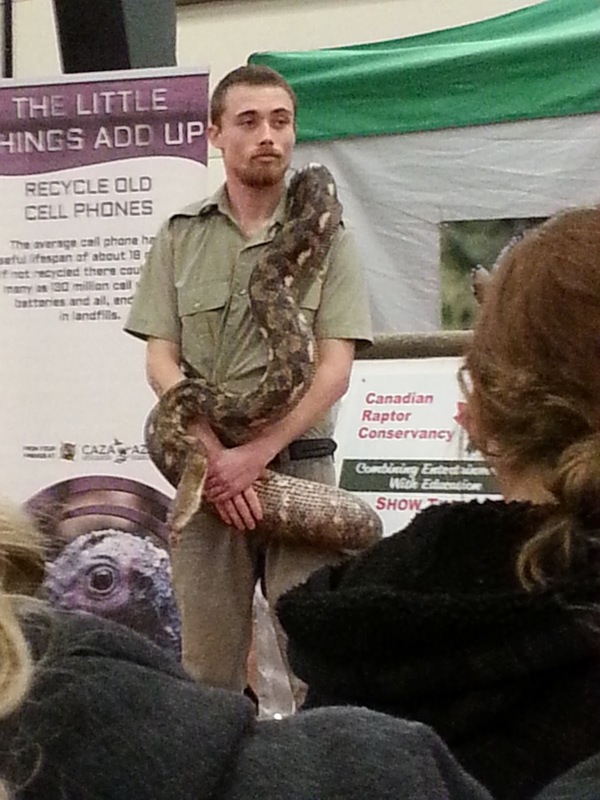 In Regina, the group teamed up with Little Ray's Reptile Zoo and the Backyard Conservation Fund of Canada, alternating the raptor shows with live snakes and reptile demonstrations. 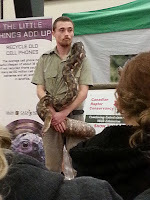 Reptiles of all kinds were also housed in display cases throughout the show area. Large poster boards and displays also gave the conversation message, and the handlers were ready to talk about their message during and between shows. 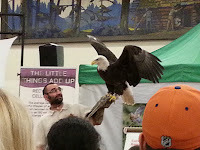 Many raptor species face habitat loss from such human activities as urban sprawl and pesticides, so these shows offer a unique opportunity for the public to interact and learn a little about ecology and conservation at the same time. Watch for the Canadian Raptor Conservancy shows as they move across Canada. Have you seen a show yet? Leave a comment and let's discuss it. Marie Powell is the author of the young adult fantasy Hawk (Five Rivers), as well as 30 other books for children and youth on a variety of topics. More information about her and her books can be found on her website at www.mepowell.com. I love reading Science books, especially those written for kids. That's because authors have to know a lot about their topic in order to distill the information into interesting and understandable communications that appeal to young readers. In the following titles, Jennifer Gardy and Tanya Lloyd Kyi make challenging scientific information readily available to young readers. These books should be in every elementary school library — and the collections of all teachers who hope to interest students in modern science. 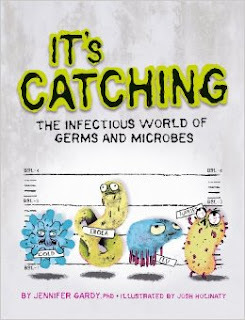 It's Catching: The Infectious World of Germs and Microbes written by Jennifer Gardy and illustrated by Josh Holinaty (Owl Kids, 2014) uses a combination of text, visuals, and anecdotes to introduce readers to the many germs with which we share this planet. The author, herself a disease detective, introduces past disease detectives, such as Antonie van Leeuwenhoek, the first person to see the microbial world. She explains that microbes exist both in the world around us and in our own bodies. Some of the details provide the necessary gross factor that kids love. 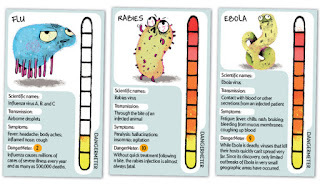 Without boring the reader, Grady outlines the difference between viruses, bacteria, fungi, and parasites. 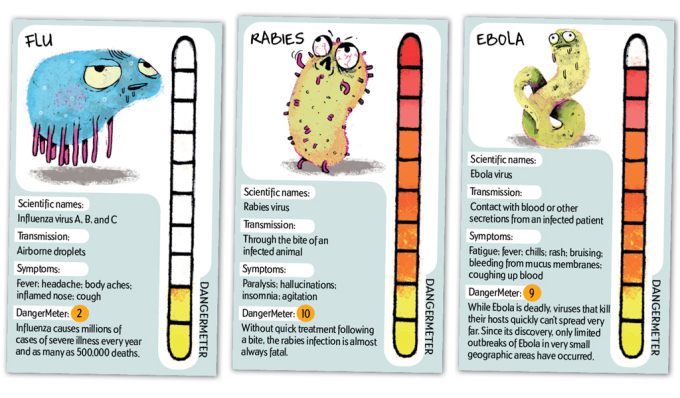 There's also a dangermeter for diseases that range from the common cold and influenza to malaria and ebola. Discussing why doctors are so worried about parents who don't have their kids vaccinated against measles? Mention the 165 BCE measles plague that killed off about one-third of Rome's population. Have students of Irish descent? Suggest researching family trees to find out how many have ancestors who came to Canada following the 1845 Irish potato blight. 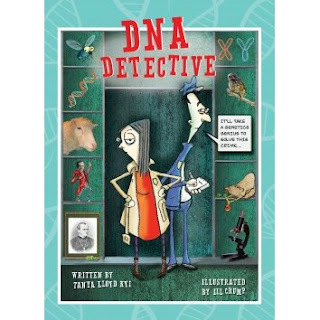 DNA Detective by Tanya Lloyd Kyi and illustrated by Lil Crump (Annick Press, 2015) is equally interesting. The intro draws kids right into the topic by showing a crime scene. Someone broke into a jewellery store and got away with valuable jewels. The perpetrator wore gloves. One was left at the scene. There are no other clues. Readers will enjoy trying to pick the culprit from a list of suspects who include the store's manager, bookkeeper, custodian, and two cashiers, as well as three customers (two of them identical twin supermodels), a sales rep, a security guard, the owner of the store next door, and a convicted thief. They can follow the thinking processes of a young detective on her first case as she collects DNA evidence in an effort to identify the culprit. The author compares DNA identification to a high-tech fingerprint. Both can be inadvertently left behind and collected from crime scenes. The book includes profiles of past DNA rock stars, such as Gregor Mendel and Rosalind Franklin. A cartoon page or spread at the end of each section brings readers back to the crime in question. The detective outlines what she's learned. In most cases, readers can use this information to eliminate suspects. By the end, the detective — and readers — have their man — er, woman. Books such as these provide excellent introductions to topics kids will continue to learn about throughout their student years — and likely their entire lives. I attended junior high in Yellowknife, which is not the most isolated place in Canada, but definitely felt like it sometimes. Fortunately, the school library was huge, and offered a portal to endless worlds I couldn't visit in the flesh. And then there was the time Sheree Fitch came to visit. To this day, I vividly remember watching in awe as she recited parts of her work-in-progress to us - a work that later became There Were Monkeys in My Kitchen. It was the first time I'd really understood that the books I loved were written by actual human beings. From there, it was a very short leap to the notion that I could write books, too. 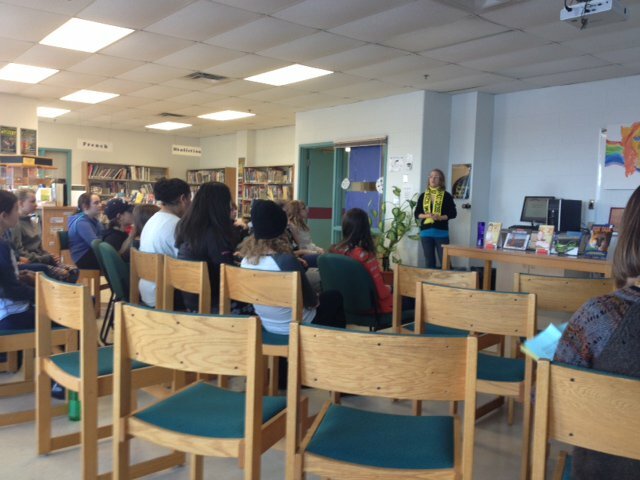 I was thinking about that moment yesterday as I stood in the library of Ridgecliff Middle School, waiting for the first class of grade 7s to file in for their author visit. I was also thinking, I am the author they are coming to see. How weird and awesome is that? And what an incredible gift, to be given the opportunity to inspire a child the way I was inspired so long ago. That's me in the crime scene scarf. Several kids asked me where to buy one! After four back-to-back renditions of my Forensic Science: Digging Into DNA presentation, I finished the day both exhausted and exhilarated. The kids were alert and engaged, asking great questions. When I told them that Alec Jeffreys, who discovered DNA fingerprinting, simulated crime scene stains by cutting himself and smearing his own blood around the lab for later testing, they were so caught up in discussing his scientific bad-assery, I had a hard time reigning them back in for the rest of the talk. 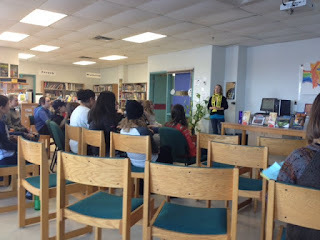 The librarian said she'd never seen the students so excited about an author visit. While I'd love to take the credit for that, the real reason for their response wasn't me - it was the science. Because science, as all Sci/Why readers know, is COOL. Science writers support both the Language Arts curriculum (because writing), and the science curriculum, making them a great bargain - two for the price of one! We can talk about research skills, too. Like any author, we can inspire kids to think about becoming writers. But the topics we present might also inspire them to become scientists. And how great would that be? Check your provincial Writers in the Schools program, the CCBC Author Directory, or the Writer's Union's National Public Reading Program for listings of science writers who do presentations. If you can't afford speaking fees, most authors will be able to direct you to funding sources that will cover the cost of bringing a guest speaker into the classroom or library. Your turn, fellow science writers - what great experiences have you had giving school presentations? 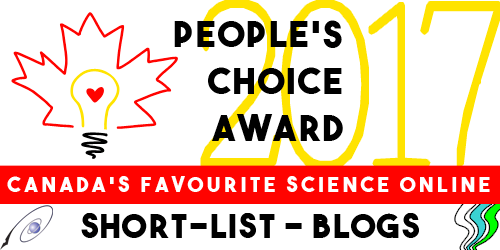 Teachers and librarians, have you ever booked a science writer for a presentation? What impact did you notice on the kids? My forensics presentation is based on two of my books for junior high and high school readers - Forensic Science: In Pursuit of Justice, and Fuzzy Forensics: DNA Fingerprinting Gets Wild. I'm currently offering deep discounts on first-edition copies of Fuzzy Forensics for educational use. Check out my website and contact me for details. What better way to start the New Year off here at Sci-Why than with some inspiration? I recently had the happy occasion to meet Filipe Deandrade, a nature filmmaker, while he was gathering footage for a new project with National Geographic. DeAndrade had won the 2015 Wild to Inspire film award, sponsored by the American Wildlife Foundation, National Geographic and the Sun Valley Film Festival for his short film, "Adapt." I think you'll like it, and hope we all find as much inspiration in our own work/lives in 2016!